Image © 2008 Mark Harris - Licensed to About.com, Inc. Even though digital music can be stored on CD-R or CD-RW as data files (commonly referred to as an MP3 CD), it is sometimes useful to create an audio CD. This type of compact disc is just like a music CD you would buy from your local store and is playable on virtually any device that has a CD or DVD drive. By creating a custom audio CD of your favorite music, you will be able to create your very own custom CDs to suite different moods. And last but not least, backing up your music onto audio CDs will keep it safe just in case disaster strikes. Downloading Windows Media Player 11: Check on the latest version of Windows Media Player 11 (WMP) and upgrade if necessary. Once you are prepared, run Windows Media Player 11 and click on the Burn tab at the top of the screen. Once you have selected the burn tab at the top of the screen, you will gain access to Media Player's built-in CD burning engine. Before starting to add music to the burn list it is first necessary to check that the type of CD to be created is set to audio CD. 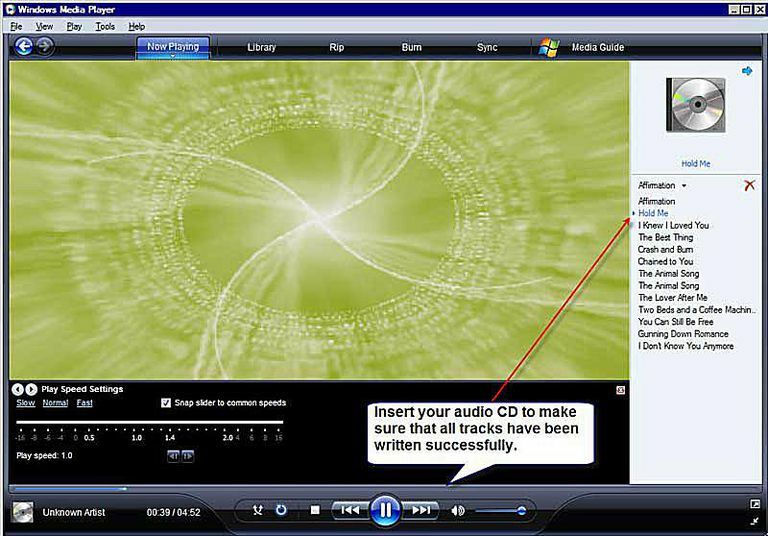 To configure Windows Media Player to do this, click on the small down-arrow icon (situated underneath the burn tab) and select audio CD from the menu that appears; the format type by default is set to audio CD. You can either add single tracks or entire albums to the burn list by dragging and dropping. To display the contents of your library, click on one of the attributes of your music library which can be found in the left pane. For example, clicking on Songs will display a list of albums and songs that are arranged in alphabetical order. If you haven't added any music to your music library yet then read the tutorial on building a music library to find out how. 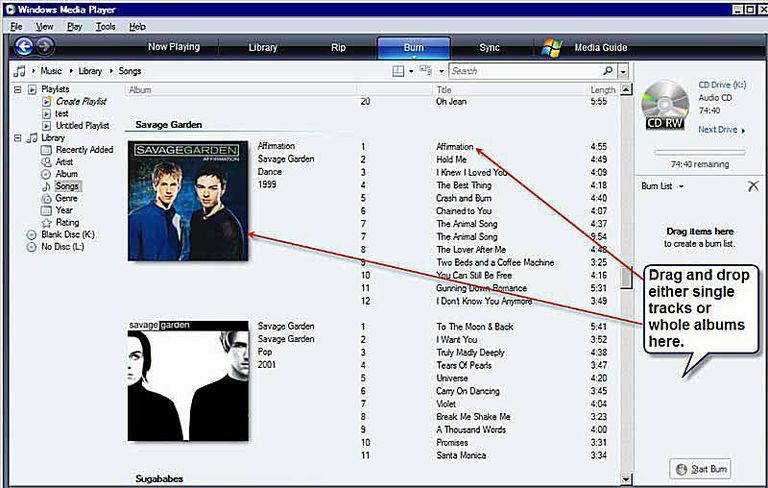 Building a burn list in Windows Media Player is very easy to do and is achieved by using the drag and drop interface. Simply click on single songs or entire albums and drag them across to the burn list area on the right-hand side of the screen. If you create a burn list that requires more than one blank CD then you will see the words Next Disc indicating that multiple blank CDs are needed. To delete files or extra CDs from the burn list, right-click on them and choose Remove From List. If you need to start from scratch and completely erase the burn list then click on the red cross to clear the entire list. When you are happy with your compilation you can now insert a blank CD-R or CD-RW disc; to erase a CD-RW that has data on it you can right-click on the appropriate drive letter (in the left pane) and select Erase Disc from the pop-up menu. If you have more than one optical drive in your system you can cycle through the drive letters by clicking on Next Drive until you reach the drive you want to use. Finally, to begin the process of burning an audio CD, click on the Start Burn icon. 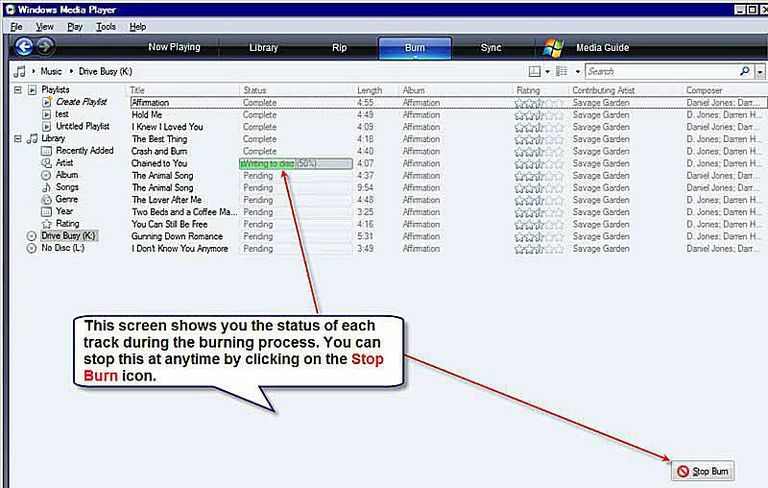 Once you have started the burn process, the screen will display a list of tracks to be written to the CD with the status of each. Each file will either have, pending, writing to disc, or complete alongside it. A green progress bar is displayed next to the track that is currently being written to CD which also gives you the progress as a percentage. If you need to stop the burn process for any reason then click on the Stop Burn icon to cease writing to the CD. Once the audio CD has been created, the CD tray will automatically eject the disc; this can be turned off by clicking on the small down-arrow icon underneath the burn tab and de-selecting Eject Disc After Burning. It's a good idea to check that all the tracks on your audio CD have been written correctly. If the disc has been automatically ejected then insert the CD back into the drive and click on the play button if it doesn't auto-play. As the CD is playing you can see the tracks on the CD if you click on the Now Playing tab.